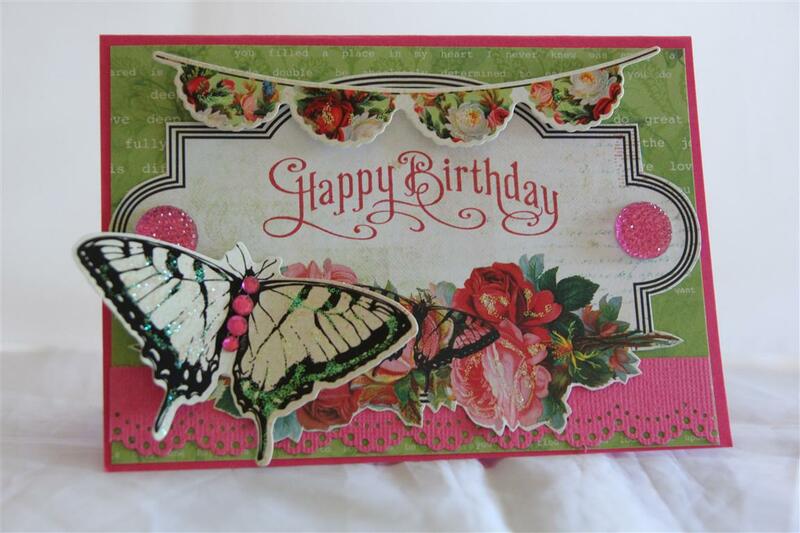 Here is the last of my Kaisercraft butterfly Kisses card series. I embossed the cardstock base with cuttlebug swiss dots folder, added a layer of paper from the paper pad and a srip punched with martha stewart lace doily punch. 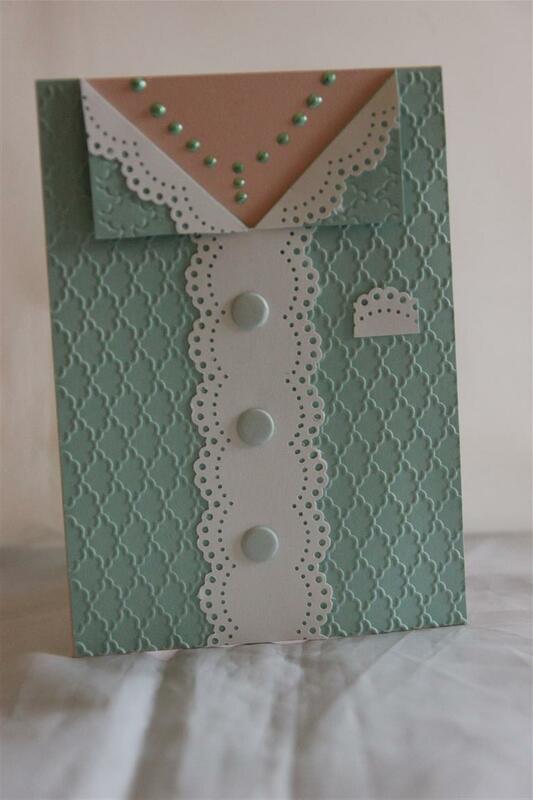 A chipboard piece from the same range and a length of spotted ribbon to finish. Tomorrow I think we will have a look at some mens cards I have been working on. Today I have ahad a lovely day in the craft room, completing an order, making a start on february lessons and playing with my new graphic 45 couture collection papers – I will have to get Nathan busy with the camera this weekend! til tomorrow….. This afternoon I taught a class over at the retirement village which reminded me I didn’t show you all the cards I taught last month over there, so here’s the first one – very simple – cardstock is all stampin up – Pool Party, blushing bride( which is the card base) and whisper white. 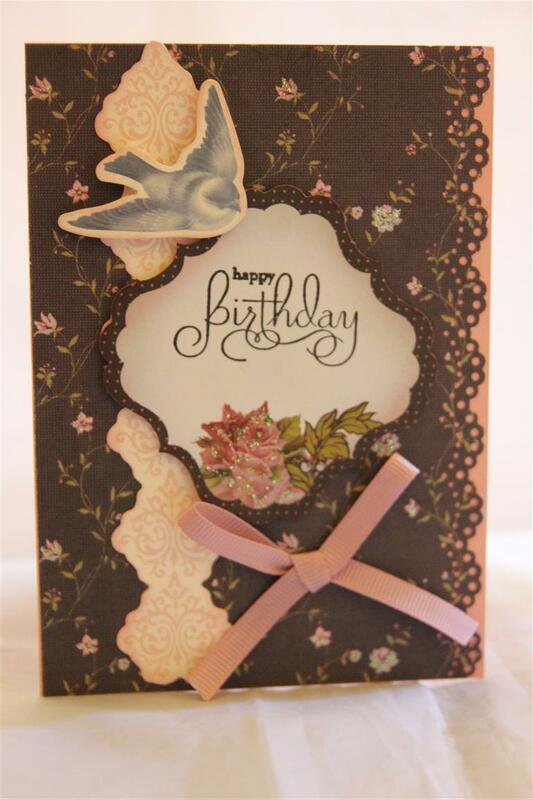 The embossing folder is Stampin up fancy Fan folder, and the border punch used is martha Stewart lace doily punch. I found the middle of the embossed piece of cardstock , cut down 4 cms, and folded each cut back to create the V necked sweater. The buttons are craftworks craft candii, and liquid pearls for the necklace. Have a look at your embossing folders – I’ll bet one of them would work for this design!A lovely evening last night spent in the craft room, and I am heading in there again this evening as all my lot are busy putting on a wrestling show…..peace…..Til tomorrow…. 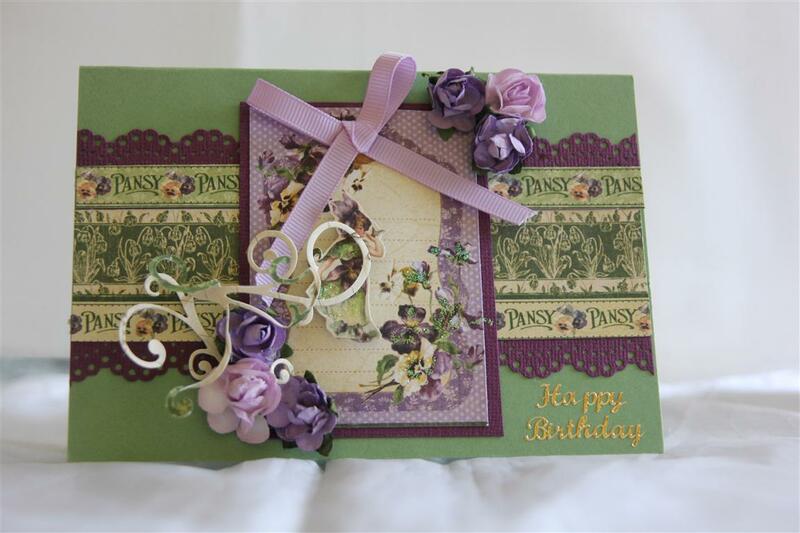 I had a lovely morning with a large group of ladies in my class today, and we were using Kaisercraft Secret Admirer patterned paper, so I thought this afternoon we would revisit this collection, as I still have quite a few cards to show in my files. 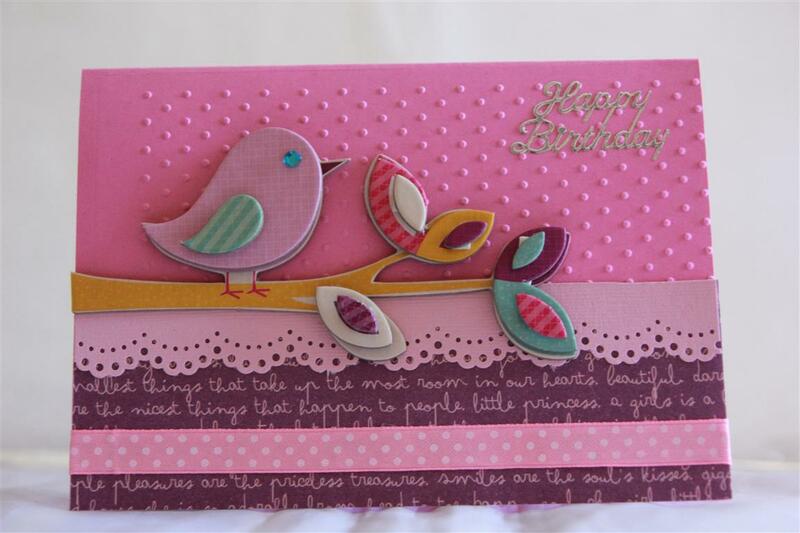 This one uses the 12 x12 paper, and the matching collectables.I punched a border strip using a martha stewart lace doily punch out of some lovely pink kaisercard, and blinged it up with kaisercraft rhinestones and sparklets. the sentiment is stamped using a stamp from Stampin Up perfectly penned set.This afternoon I have been creating with some basic grey paper, a short break to cook some dinner, and I will be back in the craft room to finish what i have started! Til tomorrow…. We are back to kaisercraft Lake House collection, which was their paper release last month, and I have enjoyed coming up with lots of different cards using this paper. For this one I covered the front of some Stampin Up Blushing Bride cardstock, after punching the right hand edge with my martha stewart lace doily edger, and decorated it with a couple of pieces from the matching collectables.Just added a greeting stamp and ribbon bow to finish.Things are coming along nicely in the craft room regarding the boys cards, so now I am thinking of having a rummage and bringing out some older papers to see if I can finish off a collection or two to make room in my shelving system for more new papers which are going to hit the shop shelves soon due to all the gorgeous new releases coming out in America.Til tomorrow….